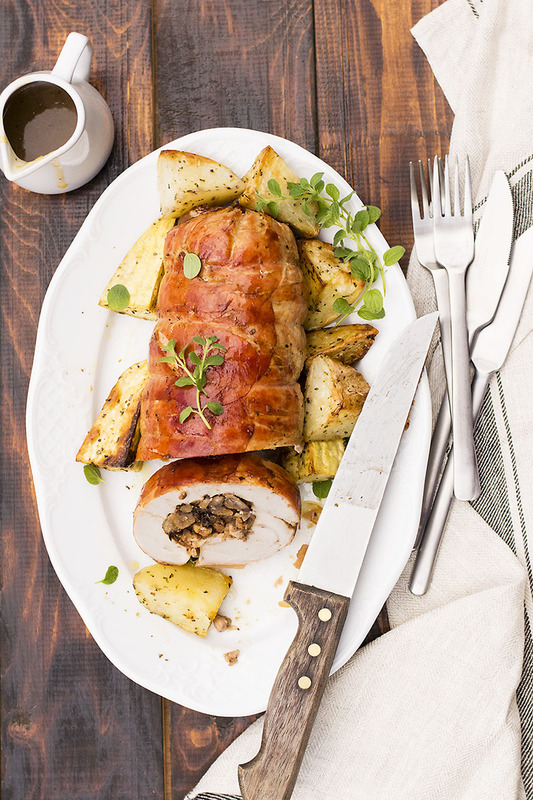 This turkey breast roulade is first stuffed with chestnuts and dried plums and then wrapped with prosciutto for a perfect festive (and gluten-free) dinner! 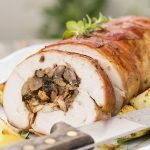 Probably the best thing about this turkey breast roulade with chestnut and plum stuffing is that the center of the roulade (meaning the stuffing) is already cooked in a saucepan. What that means is that the meat cooks more evenly and in less time because you don’t have to wait for the center part to reach the desired temperature – with the risk of overcooking the outer part. 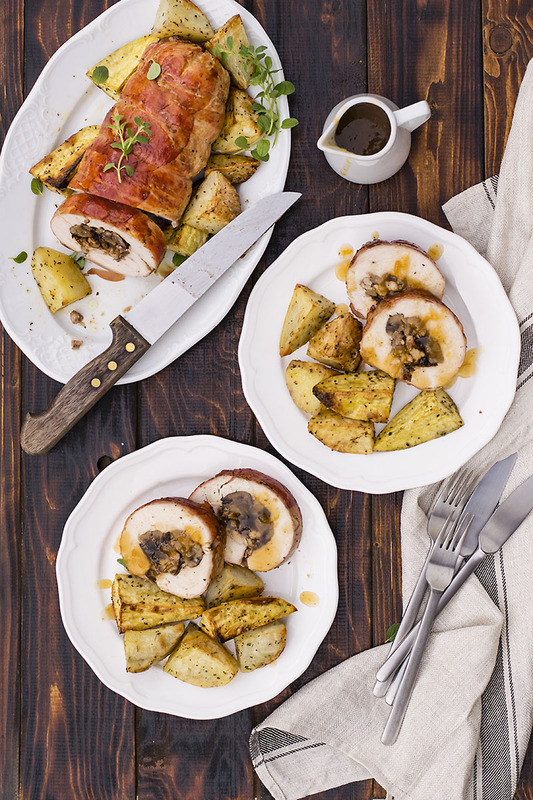 As a result, you end up with a juicy, tender meat and a flavorful and aromatic stuffing. In Greece, when we cook meat in the oven we always throw some potato wedges into the pan, so doing it with this recipe only seemed natural. Here I used some russet potatoes and some white sweet potatoes (I believe they’re also called O’Henry sweet potatoes). 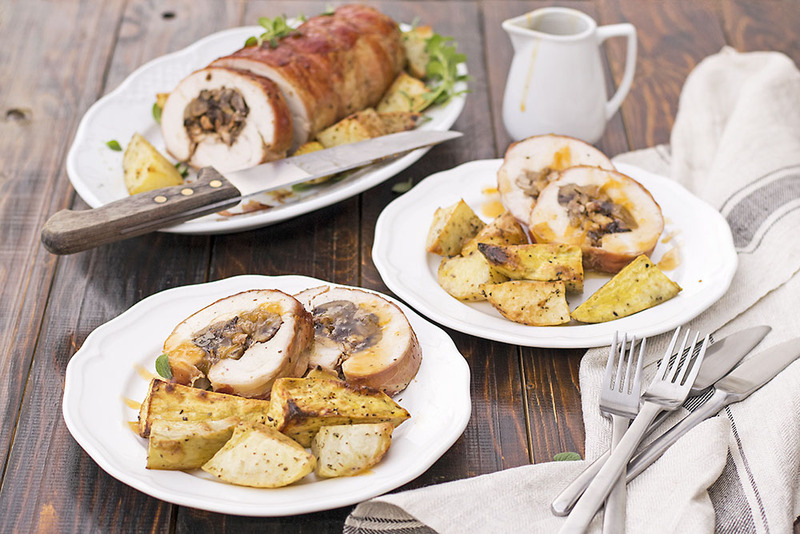 Don’t overcook the roulade! Though salting it sometime before baking helps the meat stay juicy and tender, if you cook it for too long it will dry out (and remember: the center is already cooked!). If you use an oven thermometer make sure that the edge doesn’t go all the way through the center (you don’t want it to reach the stuffing). If you can’t find prosciutto, you can use bacon instead. 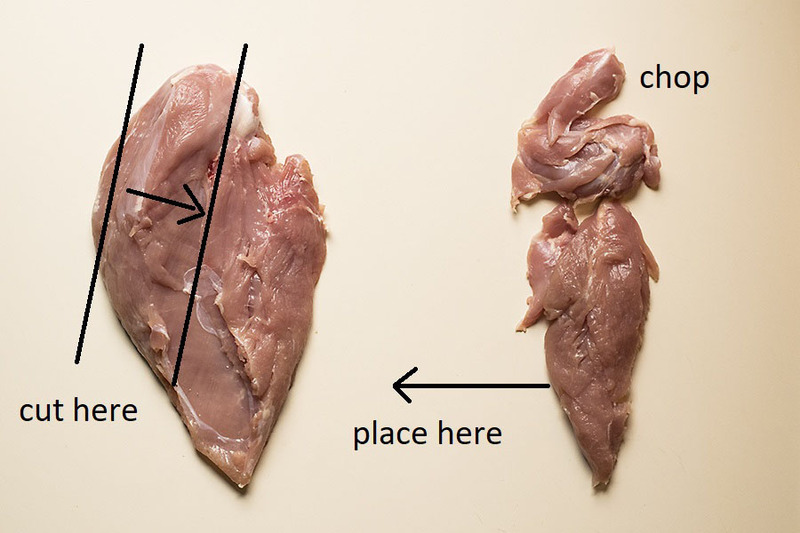 Because prosciutto strips are wider, you’ll probably need about twice the quantity of bacon. Use the same saucepan to cook the stuffing and make the gravy (less clean up). I tried to take some photos of how to butterfly a turkey breast. Hope you find them useful! 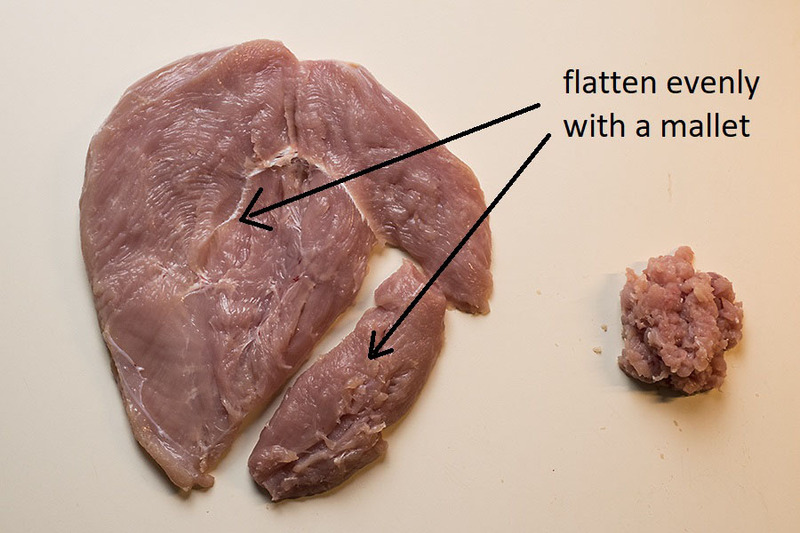 Remove any connective tissue from the turkey breast, butterfly it, and flatten it out evenly using a mallet or another heavy object like a rolling pin (if you have any scraps chop them and use them in the stuffing). You can also ask your butcher to do this for you. Sprinkle the meat with salt and pepper and let it covered at room temperature until you make the stuffing. Set a large saucepan over medium/high heat and sauté any chopped scraps from the breast with olive oil. Add the onion, cinnamon, allspice, bay leaf, a pinch of salt and pepper and cook until onion is soft and translucent (about 4-5 minutes). Add the chestnuts and plums, stir for 30 seconds and then add the wine. Cook until the wine evaporates, discard the bay leaf, and set aside to cool. Place a large piece of baking paper on your working surface. Make a row of 5 strips of prosciutto on the baking paper making sure that they overlap a little. Make another row with the other 5 strips below the first one making sure that there are no gaps between the prosciutto strips. 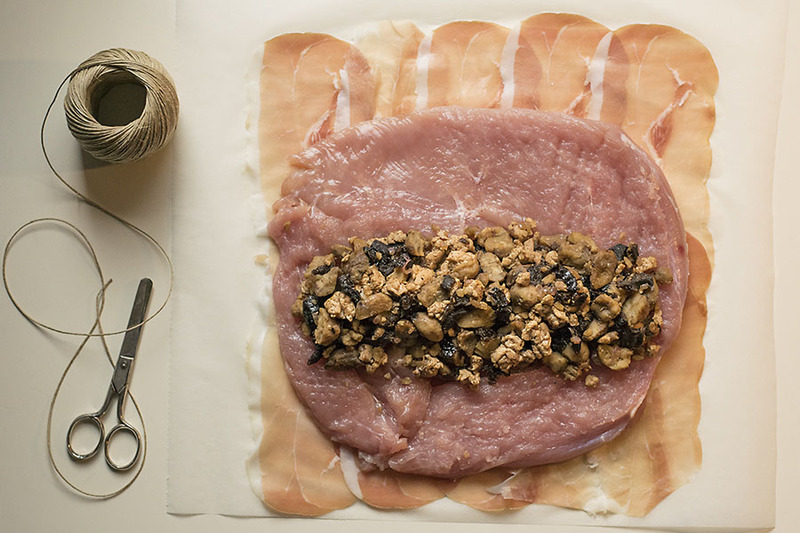 Place the butterflied turkey breast in the middle of the prosciutto surface, forming a rectangle. 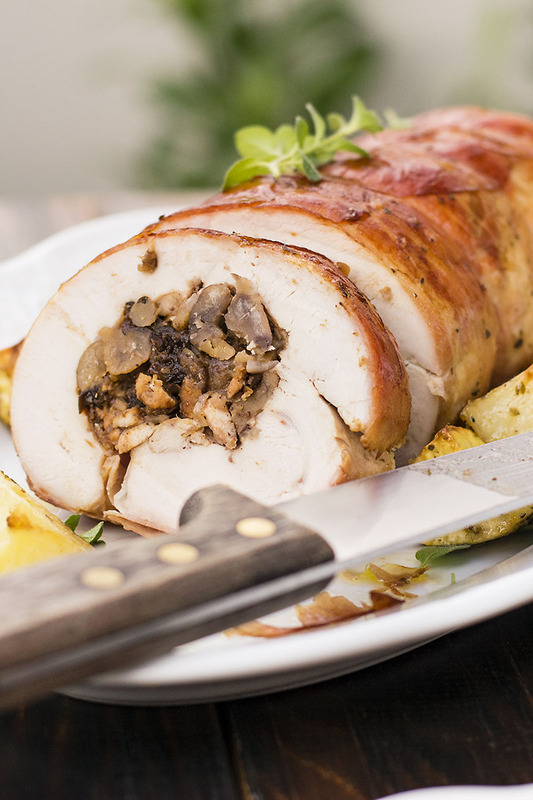 Transfer the stuffing in the middle of the rectangle and with the help of the baking paper roll the meat into a roulade. Without removing the baking paper, wrap with the kitchen twine to secure it. Transfer to a deep baking pan. In a large bowl, mix the potatoes with the olive oil, oregano, salt, and pepper. Transfer to the pan with the roulade and add the water. Bake for about 40 minutes (15 minutes per pound) or until a thermometer inserted in the meat (not in the center!) registers 165°F (74°C). 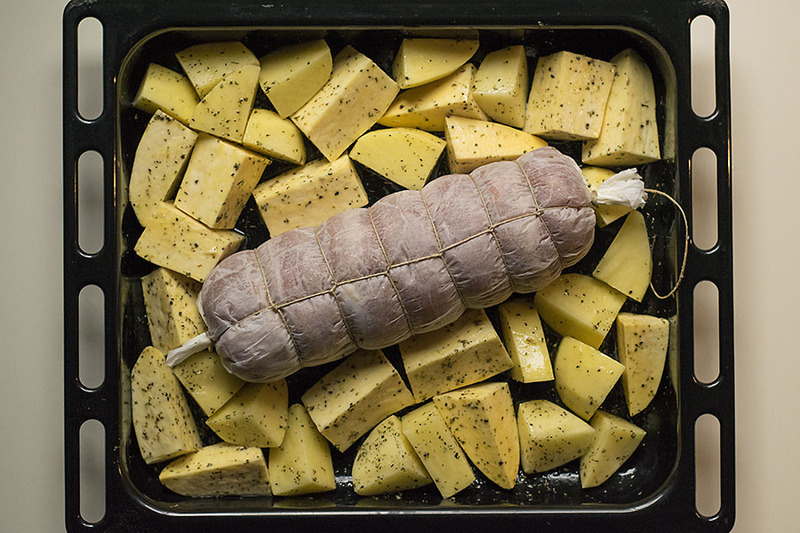 Remove the roulade from the oven and continue baking the potatoes until done (about 20 more minutes). When the potatoes are done transfer them to a plate and strain all the pan juices into the saucepan (if all the juices from the pan have evaporated, add a quarter of a cup water and stir with a spatula). Unwrap the roulade and return it to the pan. Brush with some extra olive oil and broil from each side until browned. Transfer to the plate. For the gravy: Heat the saucepan over high heat until it starts to simmer, then add the wine and cook for 2-3 minutes. Add the jam, stir to combine, and then add the butter one tablespoon at a time. Remove from heat, taste and add salt and pepper if needed. Transfer to a small bowl or saucer and serve with the roulade. Hey Heather! Yes, dripping-coated potatoes are really good! 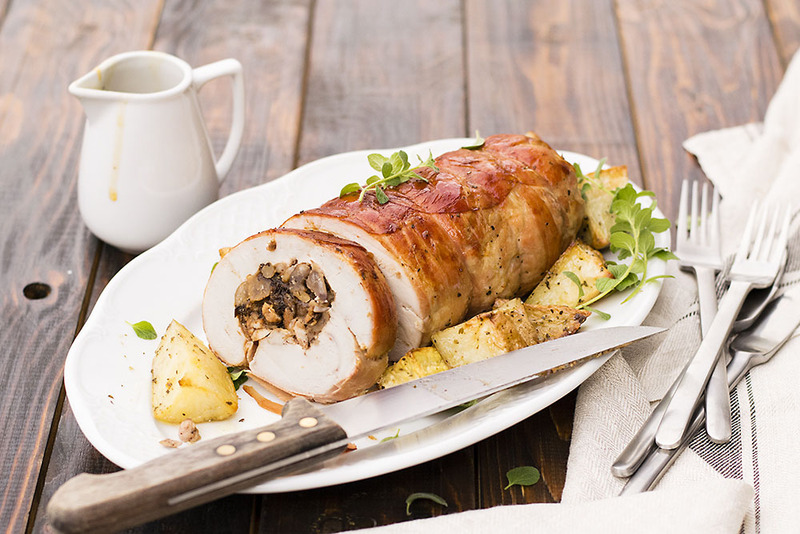 Making Roulade is a beautiful art of cooking… Preparing the meat, flattening, stuffing and then wrapping… This looks perfect with those browned prosciutto. Thank you Akhila! I make this recipe every year!